Post sponsored by The American Pecan Council. See below for more details. Fall is an amazing time for salads. The crisp airs makes for the best greens and once you have that, it’s hard to go wrong with what you add into a salad. 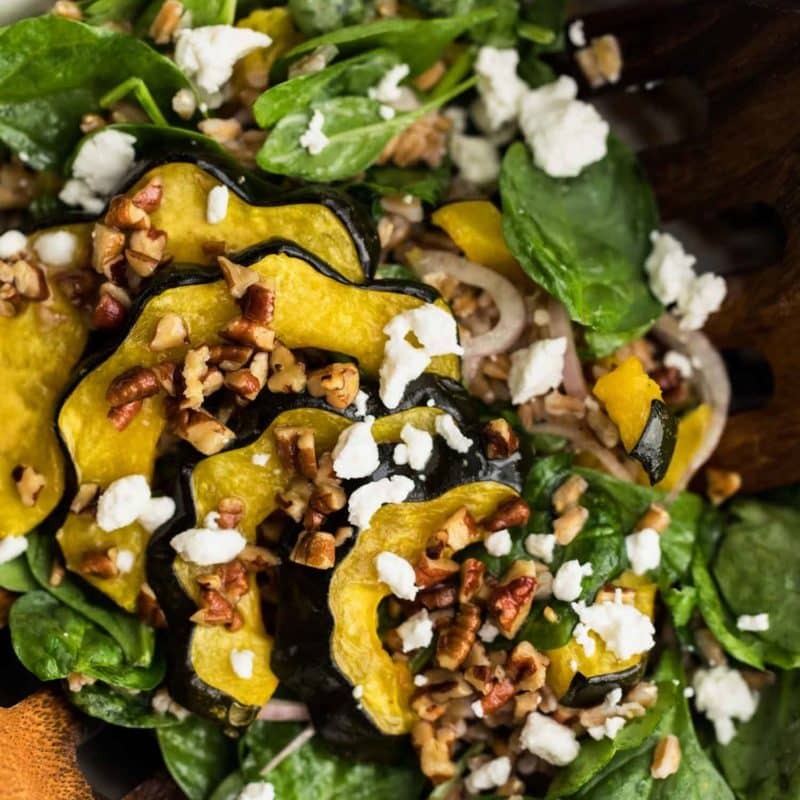 This acorn squash salad is quite possibly the best combination of all the fall flavors: roasted squash, warm grains, and a perfect pecan vinaigrette. Add to that a bit of goat cheese and shallots- you have one delicious and filling salad. I recommend making larger batch of the pecan vinaigrette and use it throughout the week. The buttery flavor of the pecans paired with a zip of the vinegar is not only perfect on salads but also for drizzling over squash halves (as a beautiful side), on sweet potatoes, or even used on a grilled cheese sandwich (an apple grilled cheese sandwich with a bit of this dressing is amazing!) Plus, the addition of pecans can really bump up the protein/fiber in any meal. 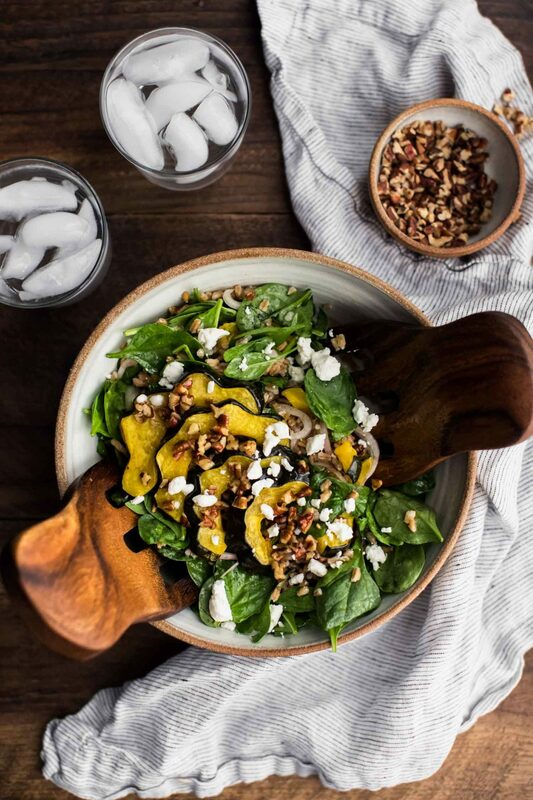 This hearty fall salad combines the flavors of roasted squash, creamy goat cheese, warm farro, and an easy pecan vinaigrette to make a power-lunch salad. Preheat oven to 425˚F. Slice a small part of one of the sides of the squash to create a base. Trim the ends from the squash, cut it in half lengthwise and scoop out the sides. Place the cut-sides down and cut the squash into ¼” thick slices. Place on a sheet tray and toss with olive oil and salt. Roast until the squash and peels are tender, 30 to 40 minutes. While the squash is roasting, heat a small skillet over medium heat. Add the pecans and toast, shaking the pan, until the nuts are fragrant. Transfer to 1/3 cup of the pecans bowl to a bowl and save the remaining pecans to use as a topping. Add the olive oil, vinegar, maple syrup, and salt while the nuts are still warm. Stir vigorously and set aside. In a large bowl combine the spinach, cooked farro, shallot, half the squash, and half the dressing. Toss to combine the salad then lay the remaining squash on top of the salad. Drizzle with remaining dressing and sprinkle with goat cheese and remaining toasted pecans before serving. Tips & Tricks: Acorn squash skin is edible but needs to be roasted long enough to make it tender. If you’re unsure, switch to using delicata squash or butternut squash (without the skin). 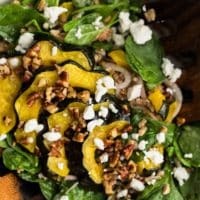 This acorn squash salad is my quintessential fall salad- the squash and pecans are a lovely, warm combination. There are some changes you can easily make, depending on what you might have on hand. Another version I love is to use kale and oat groats in place of the spinach/farro. Grains: This salad is wonderful with the hearty grains like farro or spelt. For gluten-free options use sorghum or oat groats- the texture of the grains helps balance the roasted squash. Vegan: Toss out the cheese and leave the rest of the salad as is. Greens: This salad is wonderful with spinach but the ingredients also hold up well with kale. Use whichever greens you have on hand and work best for you. 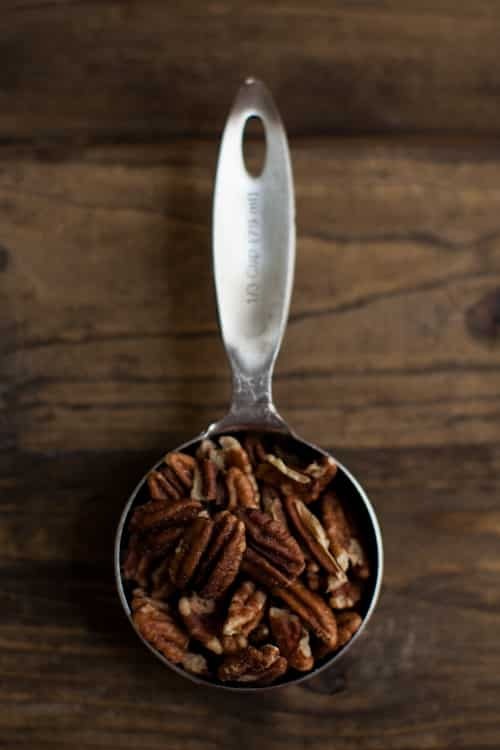 With fall here and October just around the corner, it’s really time to celebrate pecans. Late September/October is the start of harvest for pecans (and if you’ve never seen a harvest, it’s so interesting: the nuts are shaken off the tree!) I also love that pecan trees are the only major nut tree that’s indigenous to the United States. They really are majestic trees that can produce nuts for over 100 years! If you store pecans correctly, you can have a stash for up to two years. I keep a bag of pecans pieces in the freezer so that I can always add them to salads, grain bowls, and making nut-creams. I love using the pecan cream in soups and sauces but I’ve also been known to eat a handful for a snack. Also, having pecan pieces on hand makes for an easy salad topping! Disclosure: This recipe was created in partnership with The American Pecan Council. All thoughts and opinions are my own. It’s content like this that helps me keep this site running to provide the vegetarian recipes you see every week. Why Are Personal Trainers So Obsessed with Planks?